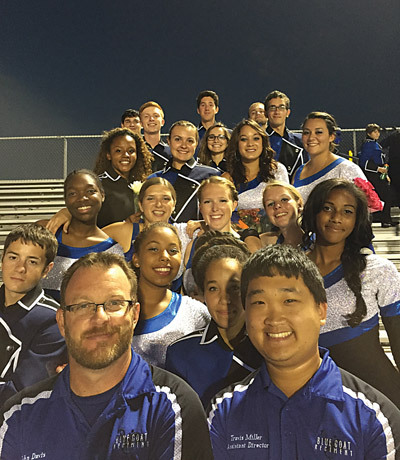 Band director John Davis (left) and assistant Travis Miller (right) with 18 seniors Oct. 18 at Senior Night. Travis Miller photos. A team of mostly freshmen and sophomores making it to the high school football playoffs? Suggest that at the start of football season, and you might get a few polite smiles and a couple: “Well, it’s always good to hope.” Any sane odds maker would happily take your money. But that’s exactly what the Riverview High School Band has done this year. The band will be competing in the state finals, the band version of playoffs. The finals will take place Nov. 22 at Tropicana Field in St. Petersburg. Some 120 bands will compete in the state finals, with the competition staged across four locations in the Bay area. “I think that will be really cool for the kids to perform in a professional stadium,” said band director John Davis, who has been teaching at Riverview for eight years and seen student interest in the activity mushroom over the last couple of years. “We are predominantly, 75 percent or so, freshmen and sophomores, and for a group so young to qualify so high — that is a really big deal,” Davis said. So how did this group of relatively inexperienced youngsters make it to the elite level of marching band competition in Florida? A commitment to the marching band is no easy task for the young musicians. They practice twice a week for three hours at a time, Monday and Thursday nights after school. Reed Shaw, who plays baritone horn with the band and is one of the few seniors among the group, has been playing with the Sharks since he was a freshman. This will be his first taste of postseason competition. 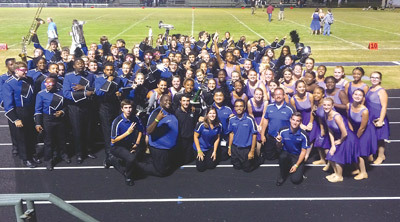 The Blue Coat Regiment after their victory at the Chamberlain Invitational on Oct. 18. 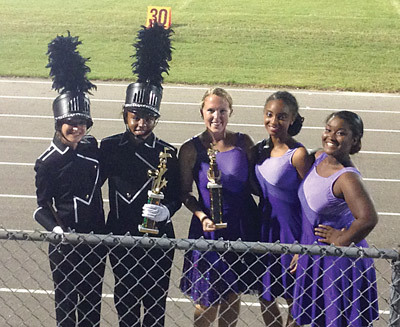 Senior student officers, from left, Deputy Drum Major Shara Crane, Drum Major Jasmine Cherry, Color Guard Captains Lindsay Dible, Emerald Armstrong and Jayla Lewis after victory at Durant High School’s West Coast Invitational, where the Sharks won Best Color Guard overall and 2nd in class 4A.